With XVideosharing you can create your own video sharing, tube, or paid member access site. It can be easily monetized with ADs (context banners, pre-rolls, popunders, etc) or by selling premium access. Reverberation VST is a classic reverberation with analog and tube emulation. Flanger VST is a classic Flanger with analog and tube emulation. Flanger VST is a classic Flanger with analog and Tube emulation. The plug-in contains: Tube section. Flanger section. Plugin creates effect of intellectual boosting of harmonics in terms of Intellectual Information Technology (IIT) Development of this plugin was inspired also by psychoacoustics research of Shlejonkin Alexandr and russian works on mathematical physics. This user friendly software is made to demonstrate the thermal design calculations and analysis of Kettle type reboilers.The software can be used to make preliminary sizing calculations that will help to give a clear outlook of the initial design. Bass Landscapes VST & AU is a new bass boost audio plugin that creates new harmonics. With help of low-mid boost you can properly suite your bass or kickdrum in the mix. Saw Landscapes is created on base of the Bass Landscapes VST. Saw Landscapes is the soft synthesizer which is designed for playing different musical compositions of any genre. Delphi/C++ Builder VCL and FireMonkey(FMX) components for fast video processing. Allows fast complex video manipulations with zero lines of program code. The library supports huge number of formats and technologies. Free for non-commercial use. 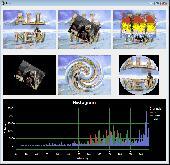 VideoLab is a set of .NET 2.0-4.5 components for fast video processing. Allows fast complex video manipulations with just few lines of program code. The library supports huge number of formats and technologies. Free for non-commercial use. DRAGSENS Geo Software is used for the exact position estimation of a towed body, sensor, camera, array or net, dragged behind a ship, aircraft or vehicle. The software allows a real-time estimation of the position of a dragged sensor. The SibCode Medical Icon Library is a comprehensive set of icons that covers most of the possible medicine-related application's needs. All icons in have been handcrafted by professional artists. The choice of professionals at an affordable price! Freeware guitar amp and effects processor with a more than 30 different devices. There are a total of 20 models of pedals, 2 amps, 7 speakers models and 3 rack units. SubsTractor is created on base of the popular Propellerhead Reason soft synthesizer SubTractor. Subtractor is an analog-type polyphonic synthesizer based on subtractive synthesis, the method used in analog synthesizers. Electro Bass Landscapes is the electro bass ROM synthesizer which is designed for playing different musical compositions of any genre. It is also intended for creating some musical effects in cinema and play scoring, in studio. Lizard Morph is detune and morph effect designed to deliver the powerful, penetrating sounds favoured by trance musicians. It's ideal for use in trance, dance, techno, dubstep, electronica, drum n bass, big beat, dub, reggae and all other styles. Analog Voice is vintage style subtractive synthesis synthesizer with extended possibilites of modulation. It has 4 types of analog style sounding filters onboard and also has reverb and delay. Amusing sounds of the body is a VSTi format plug-in for Windows, which adds the sound and atmosphere of amusing recordings to your tracks and mixes. The purpose of the plug-in is to add sounds typically found in the body. For this goal, Noise has 21 sound profiles, including the sound of sniff, pee, itches, farts, etc. Resonator is VST resonance and morph effect designed to deliver the clear, penetrating sounds favoured by live musicians. It's ideal for use in trance, dance, techno, dubstep, electronica, drum n bass, big beat, dub, reggae and all other styles. Gangnam Vocoder is vintage style 10 bands vocoder effect with extended possibilites of modulation. It has 4 types of analog style sounding filters onboard. Its good for creation of synthetic voice. Alice-1377 is created on base of the classical soviet synthesizer Alisa-1377. Alisa-1377. This electronic musical synthesizer intends for signal's design of audible range of band with a possibility to play solo musical compositions. Polyvoks Station is created on base of the legend soviet synthesizer Polivoks. Polivoks is the portable electronic musical synthesizer which is designed for playing different musical compositions of any genre. Q9 Oldvox is analogue synth with powerful configuration. Contains an automatic mode detune. Two separate oscillator and filter and LFO. Rhythm - 2 is created on base of the legend soviet synthesizer Ritm - 2. Ritm - 2. Made by Kirovsky musical instruments' factory in 1984) The EMI Ritm 2 is an one-voice keyboard synthesizer.